Volume 1 | Issue 1 | Apr – June 2016 | Page 43-46|Surulivel Vignesh Jayabalan, V C Anil Chander, Ganesan G Ram, K Karthik Kailash. Authors :Surulivel Vignesh Jayabalan, V C Anil Chander, Ganesan G Ram, K Karthik Kailash. Ortho department, Sri Ramachandra Medical Collage, Porur.Chennai.600116. Background: Standalone anchored spacers were aimed at reducing complications associated with traditional plating while maintaining the functionality of interbody spacer and plating. In this study, we prospectively followed up patients who underwent ACDF in single or multiple levels using the Polyetheretherketone (PEEK) Prevail cervical interbody device (Medtronic, Memphis, TN). Method: Prospective study of 40 patients suffering from single or two level degenerative cervical disc diseases from C3-C4 to C7-T1 operated from May 2012 to May 2014. All patients underwent surgery using PEEK prevail device. 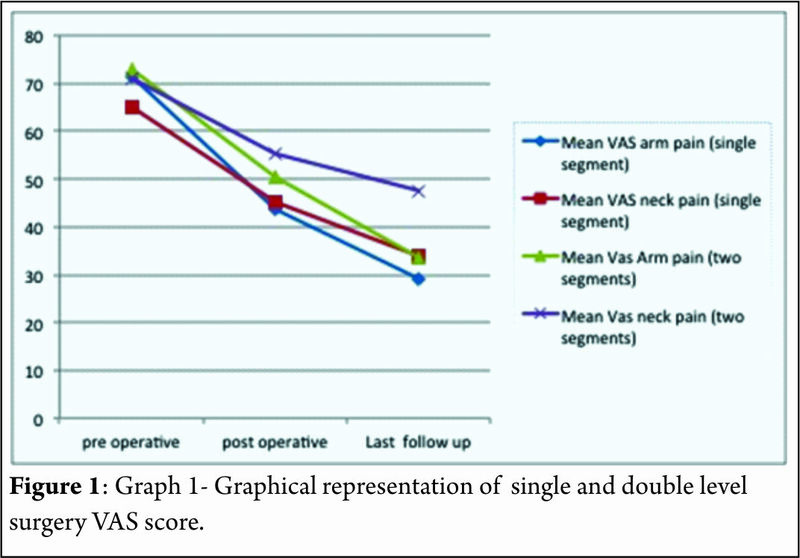 Patients were evaluated using VAS neck pain and arm pain scores and disability scores. Clinical improvement was also graded by Odom’s criteria at final follow up. Conclusion: The use of standalone cages in anterior cervical decompression and fusion provides short time clinical and radiological improvement with minimal complication rates although long terms follow up with these devices is known. Keywords: VAS score, Standalone cages, Kyphotic angle, Odom’s criteria. Surgical treatment has been advocated for long in patients with cervical disc disease with radiculpathy and/or myelopathy in whom conservative treatment fails. ACDF with plating and bone grafting/ interbody cages has been an effective surgery with good early and late post operative functional and radiological outcomes even in multi level procedures .Complication like dysphagia, tracheo esophageal injury, screw loosening with migration and soft tissue damage  adjacent level degeneration especially in multi level cases  and donor site morbidity with autologous iliac crest bone grafting were associated with this surgery. Thus in the late past decade, zero profile stand alone devices with screws were introduced for use in ACDF surgeries . These were aimed at reducing complications associated with traditional plating while maintaining the functionality of interbody spacer and plating. In this study, we prospectively followed up patients who underwent ACDF in single or multiple levels using the Polyetheretherketone (PEEK) Prevail cervical interbody device (Medtronic, Memphis, TN). Prospective study of 40 patients suffering from single or two level degenerative cervical disc disease from C3-C4 to C7-T1 operated in Sri Ramachandra Medical university between May 2012 to May 2014. Informed consent were obtained from all the patients and ethical clearance was obtained from institutional ethical committee. Patient included in the study were skeletally mature with unilateral or bilateral radicular pain with/ without associated neck pain. All the patients had MRI done and confirmed single or two level cervical disc disease from C3-C4 to C7-T1 and had completed at least six weeks of conservative treatment without any improvement. The exclusion criteriae were previous surgery at the diseased level,congenital or iatrogenic fusion of the adjacent level, patients needing more than two levels of surgery, developmental cervical stenosis, systemic or local infection, active rheumatoid arthritis, uncontrolled diabetes and other co morbidities compromising surgical outcome,severe Osteoporosis,Known allergy to PEEK or titanium alloy and pregnancy or planning for pregnancy during the study period. 30 patients had single level disease and ten patients had two level disease. All patients underwent surgery using PEEK prevail device.Patients were evaluated using VAS neck pain and arm pain scores and disability scores (NPAD-D) . All patients were operated with a head extension in supine position. Post operatively, patients were mobilised under supervision with soft collar support in the first post operative day. No active physiotherapy of the neck was allowed for six weeks. Patients were assessed using the above mentioned scores at the time of discharge and then at six weeks, three months, three months and every six months thereafter.Three patients were lost to follow up at three months and were exclude from the study, leaving 37 patients for final analysis. Clinical improvement was also graded by Odom’s criteria  at final follow up. Length and Severity of Post operative dysphagia were recorded by Bazaz’s criteria at each follow up .Implant related and surgery related complications were documented. Pre and post operative radiographic parameters were assessed by two independent investigators. Three parameters namely Inter body height, Segmental kyphotic angle, overall kyphotic angle and inter spinous distance were assessed radio logically in the pre op, immediate post op periods and during every follow up using the lateral radiographs. Pitzen’s criteria were used to assess fusion which is defined as absence of radio lucencies and absence of bony sclerosis and evidence of bridging trabaculae within the fusion area. A decrease in more than two mm of IBH during follow up was termed segmental collapse indicating implant subsidence. An increase in interspinous distance of more than two mm in flexion extension radiographs indicated non union. CT scans were taken at one year follow up for 20 patients who consented for additional imaging (15 single level and five bi segmental patients). Statistical analysis was performed using SPSS software (version). Student’s paired t test was use to assess the significance of difference between means. The mean follow-up of 37 patients continued in the study was 21.5+_2.5 months. 15 of 37 patients followed up had symptoms of mild dysphagia (40%) at immediate post op period (VAS throat pain score of 39.25+_7.2). Out of these 15, only 3(8%) had mild dysphagia at 3 months follow up (VAS throat pain score of 32.72+_6.9). The mean VAS arm pain, mean VAS neck pain and mean NPAD-D scores were tabulated as per table 1 and table 2. The graph 1 represents single level and two level VAS score. According to Odom’s criteria, 27 patients (73%) had good outcome, four (10%) patients had excellent outcome and three (8.5%) had fair outcome and three (8.5%) had poor outcome. The Pearson correlation coefficient for interobserver variability was 0.82, 0.84 and 0.78 for IBH, SKA and OHA, respectively, indicating good to excellent correlation amongst the observers(Table 3). The mean interbody height increased significantlyafter surgery. There was significant improvement in segmental and overall kyphotic angles after surgery.Only two patients had an increase in interspinous distance of more than two mm in flexion-extension x rays. Three patients (8%) had evidence of non union at one year follow up x rays according to Pitzen’s criteria.10 (27%) patients had radiologically significant subsidence.According to CT based Bridwell’s criteria, 16 of these patients had Grade I fusion (80%), two patients had grade II fusion (10%) and one patient had grade III fusion (52 year old male with bi segmental surgery) and one patient had frank pseudoarthrosis. None of these patients showed evidence of vertebral fracture or encroachment of screws in foramen transversarium. The major concern in standalone devices is whether they provide biomechanical stability enough to achieve fusion. Studies using anchored spacers with 4 screw construct , three screw construct  and two screw construct showed comparable biomechanical stability in flexion-extension, lateral bending and axial torsion with standard anterior plating. The “I beam” shape of the cage and Nitinol locking mechanism increases the stability of screw implant interface. PEEK material used in our implant is radio opaque allowing for better evaluation of fusion and it is more rigid than autograft. Moreover, several studies have shown PEEK to provide 100% fusion rates with good to excellent clinical outcome  with minimal subsidence maintaining foraminal decompression and sagittal alignment . Hofstetter et al  evaluated post operative radiographs for pre vertebral swelling  and found that patients operated with plates had significant post operative prevertebral swellings that persisted for more than six months compared to patiens who had Zero profile device fixation. Decreased incidence of midterm and late dysphagia in our study and other studies with zero profile devices, clearly support the hypothesis of hardware prominence and scarring associated with plating leading to prolonged dysphagia symptoms [12,14]. More over most our patients had odynophagia rather than true dysphagia, indicated by increased VAS throat pain scores in early post operative period. Adjacent level ossification is another concern in plating. The cervical plates reaching the adjacent disc levels can induce and accelerate disc degeneration and osteophyte formation,leading to future complications. Park et alrecommend placing the plate at least five mm away from the adjacent disc space to decrease the risk of ossification. In our study, no patient had adjacent level ossification at final follow up X rays which is the case with other studies with stand alone cages . Several studies have shown that fusion and clinical outcomes decrease with increasing levels of surgery, especially when three or more levels are involved  inspite of implant stabilisation. But, Wang et al in their review of 60 patients with two level ACDF suggested that addition of plates significantly reduced pseudoarthrosis compared to non plated group. Guiseppi et al used ‘hybrid technique’ in which multilevel surgeries were done with a combination of Zero-p device and CFRP device (Depuy, synthes). More than 90% fusion rates with significant improvement of clinical outcome scores with minimal implant related complications were seen. They also outlined several technical tips in implanting these devices in multi level patients. In our study 87% of patients had excellent to good outcomes and 13 % had fair to poor outcomes which is comparable to other studies with ACDF and plating  and stand alone cages . Moreover, 92% and 90% of patients had x ray and CT scan proven fusion rates respectively. Two patients with CT proven pseudoarthrosis (3 and 4 Bridwell’s grading) were multilevel patients with significantly poor clinical outcome. One of the reasons for Favourable clinical and radiological outcome in our study might be due to the exclusion of patients with three or more level pathologies from the study group. There are several limitations in our study. They include absence of control group, relatively smaller number of patients with shorter follow up duration. Moreover, CT scan, one of the most accurate tools to assess the fusion is done in just over 50% of patients. Outcome studies after ACDF are usually measured using fusion rates in most of the studies although Yue et al  concluded that clinical outcome was not related to fusion rates, smoking, number of levels operated, collapse or subsidence. More over recent literature has suggested that radiographic results alone are not suggestive of successful clinical outcome. Quality of life measurement is an important tool to assess post operative outcome  which is also a draw back in our study as we did not use health status questionnaire such as SF36. Radiological outcome other than fusion is assessed with three criteria namely IBH, SKA and OKA (cervical Cobb angle) . How far these measurements correlate with clinical improvement is not known. The mean IBH increased significantly after surgery from pre operative values and then decreased slightly after surgery. The mean preoperative SKA value is negative indicating relative segmental kyphosis in operated levels. The mean SKA and OKA improved significantly at final follow up compared to pre operative values. Minimal subsidence is an invariable consequence of any interbody fusion device as seen in our study. Since the implant subsidence cannot be measured due to the radiolucency of the implant, it was indirectly measured by the loss of inter body height in any of the follow ups. Keeping stringent criteria of > or = two mm for segmental collapse tend to overestimate subsidence as in our study. But the segmental collapse didn’t translate clinically, as these patients had no significant increase in neck or arm pain scores in any of the follow ups. Vaccaro et al  in a recent literature review reported an incidence of screwand plate loosening between 0% and 15.4%, screw breakagebetween 0% and 13.3%, plate breakage between 0% and 6.7%, plate and graft displacement (with or withoutgraft fracture) between 0% and 21.4%, and implant malposition(screws in discs, plating of unfused segments, etc) between 0% and 12.5% for long segmental anterior platefixation. None of these complications were seen in our series indicating that the implant and the surgical technique give reproducible midterm results with minimal complications in single and two level surgeries. Non operative treatment of axial neck pain with or without radiculopathy is successful in around 75% of patients . In patients with failed non operative treatment, fusion and cervical disc arthroplasty remain two major surgical options . Although disc arthroplasty seems to be a viable option in cervical spine compared to lumbar spine, less than 50% of patients meet the inclusion criteria for this procedure as per Auerbach et al . In these patients where motion preserving surgery is contraindicated, anterior cervical decompression and fusion remains the operative treatment of choice for both axial neck pain  and cervical radiculopathy , although patients with isolated axial neck pain are excluded from our study. The results from our prospective study indicate that use of standalone cages in anterior cervical decompression and fusion provides short time clinical and radiological improvement with minimal complication rates although long term follow up with these devices is known. Further long term studies are required to validate the usage of these devices, especially in multi level disease. 1. Song KJ, Taghavi CE, Lee KB, Song JH, Eun JP. The efficacy of plate construct augmentation versus cage alone in anterior cervical fusion. Spine (Phila Pa 1976). 2009 Dec 15;34(26):2886-92. 3. Park JB, Cho YS, Riew KD. Development of adjacent-level ossification in patients with an anterior cervical plate. J Bone Joint Surg Am. 2005 Mar;87(3):558-63. 4. Barbagallo GM, Romano D, Certo F, Milone P, Albanese V. Zero-P: a new zero-profile cage-plate device for single and multilevel ACDF. A single institution series with four years maximum follow-up and review of the literature on zero-profile devices. Eur Spine J. 2013 Nov;22 Suppl 6:S868-78. 6. Bazaz R, Lee MJ, Yoo JU. Incidence of dysphagia after anterior cervical spine surgery: a prospective study. Spine (Phila Pa 1976). 2002 Nov 15;27(22):2453-8. 7. Scholz M, Reyes PM, Schleicher P, Sawa AG, Baek S, Kandziora F, Marciano FF, Crawford NR. A new stand-alone cervical anterior interbody fusion device: biomechanical comparison with established anterior cervical fixation devices. Spine (Phila Pa 1976). 2009 Jan 15;34(2):156-60. 8. Stein MI, Nayak AN, Gaskins RB 3rd, Cabezas AF, Santoni BG, Castellvi AE. Biomechanics of an integrated interbody device versus ACDF anterior locking plate in a single-level cervical spine fusion construct. Spine J. 2014 Jan;14(1):128-36..
9. Panjabi MM, Cholewicki J, Nibu K, Grauer J, Babat LB, Dvorak J. Critical load of the human cervical spine: an in vitro experimental study. Clin Biomech (Bristol, Avon). 1998 Jan;13(1):11-17. 10. Niu CC, Liao JC, Chen WJ, Chen LH. Outcomes of interbody fusion cages used in 1 and 2-levels anterior cervical discectomy and fusion: titanium cages versus polyetheretherketone (PEEK) cages. J Spinal Disord Tech. 2010 Jul;23(5):310-6. 11.Celik SE, Kara A, Celik S: A comparison of changes over timein cervical foraminal height after tricortical iliac graft or polyetheretherketonecage placement following anterior discectomy.J Neurosurg Spine 6:10-16, 2007. 12. Hofstetter CP, Kesavabhotla K, Boockvar JA. Zero-profile Anchored Spacer Reduces Rate of Dysphagia Compared With ACDF With Anterior Plating. J Spinal Disord Tech. 2015 Jun;28(5):E284-90. 13. Kepler CK, Rihn JA, Bennett JD, Anderson DG, Vaccaro AR, Albert TJ, Hilibrand AS. Dysphagia and soft-tissue swelling after anterior cervical surgery: a radiographic analysis. Spine J. 2012 Aug;12(8):639-44. 14. Miao J, Shen Y, Kuang Y, Yang L, Wang X, Chen Y, Chen D. Early follow-up outcomes of a new zero-profile implant used in anterior cervical discectomy and fusion. J Spinal Disord Tech. 2013 Jul;26(5):E193-7. 15. Scholz M, Schnake KJ, Pingel A, Hoffmann R, Kandziora F. A new zero-profile implant for stand-alone anterior cervical interbody fusion. Clin Orthop Relat Res. 2011 Mar;469(3):666-73. 16. Sasso RC, Ruggiero RA Jr, Reilly TM, Hall PV. Early reconstruction failures after multilevel cervical corpectomy. Spine (Phila Pa 1976). 2003 Jan 15;28(2):140-2. 17.Anderson DG, Albert TJ. Bone grafting, implants, and platingoptions for anterior cervical fusions. Orthop Clin North Am.2002;33:317–328. 18.Yue WM, Brodner W, Highland TR: Long-term results afteranterior cervical discectomy and fusion with allograft andplating: A 5- to 11-year radiologic and clinical follow-up study.Spine (Phila Pa 1976) 2005;30:2138-2144. 19.Klein GR, Vaccaro AR, Albert TJ: Health outcome assessmentbefore and after anterior cervical discectomy and fusion forradiculopathy: A prospective analysis. Spine (Phila Pa 1976) 2000;25:801-803. 20.Jae Sik Shin, Sung Han Oh, Pyoung Goo Cho. Surgical Outcome of a Zero-profile Device Comparing with Stand-aloneCage and Anterior Cervical Plate with Iliac Bone Graft in the AnteriorCervical Discectomy and Fusion. Korean J Spine 2014;11(3):169-77. 22. Gore DR, Sepic SB, Gardner GM, Murray MP. Neck pain: a long-term follow-up of 205 patients. Spine (Phila Pa 1976). 1987 Jan-Feb;12(1):1-5. 23. Nabhan A, Ahlhelm F, Pitzen T, Steudel WI, Jung J, Shariat K, Steimer O, Bachelier F, Pape D. Disc replacement using Pro-Disc C versus fusion: a prospective randomised and controlled radiographic and clinical study. Eur Spine J. 2007; 16:423–430. 24. Auerbach JD, Jones KJ, Fras CI, Balderston JR, Rushton SA, Chin KR. The prevalence of indications and contraindications to cervical total disc replacement.Spine J. 2008;8:711–716. 25. Riley LH 3rd, Skolasky RL, Albert TJ, Vaccaro AR, Heller JG. Dysphagia after anterior cervical decompression and fusion. Spine 2005;30(22):2564–2569. 26. Gore DR, Sepic SB: Anterior discectomy and fusion for painful cervical disc disease: A report of 50 patients with an average follow-up of 21 years. Spine (Phila Pa 1976) 1998;23:2047-2051. How to Cite this Article: Jayabalan SV, Chander VC, Ram GG, Kailash KK. Standalone Anchored Spacer for Anterior Cervical Decompression and Fusion-short Term Analysis. International Journal of Spine Apr – June 2016;1(1):43-46 .